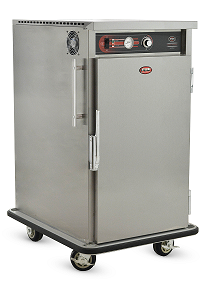 Heated holding equipment is the backbone of any commercial foodservice operation. 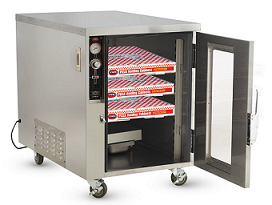 While keeping products at a safe service temperature, heated holding equipment enables food to be kept for varying lengths of time - from short term staging to prolonged periods. FWE offers a range of equipment models that are as diverse as the industry itself. FWE has been awarded "Best in Class" by consultants for the third year in a row for mobile hot holding equipment, so you can rest assured you are getting the best quality equipment available. Many foodservice operations heavily use sheet trays to cook, hold and prepare a variety of foods. Tray use enables greater food transport and introduces a great deal of flexibility. FWE's tray servers are the perfect fit for kitchens looking to hold their product on sheet trays. Bringing a tray server into a kitchen operation will keep bulk foods hot, moist and oven fresh, longer. Whether you are using these servers in a stationary or transport application, FWE has a tray server to meet your capacity and size needs. All tray servers come standard with no tip tray slides. Tray slide grip design secures sheet trays from moving side-to-side for stabilized transport while supporting tray load from bottom. With these slides, trays and pans will not tip even when pulled out halfway, allowing for easier 'hands free' access to contents of the cabinet. FWE's unique rod style tray slides enable cabinets to hold almost any combination of trays and pans at the same time. The unique tray slide design allows heat to reach all areas, holding a consistent temperature throughout the cabinet. In addition to being fully adjustable, tray slides remove easily without tools for thorough interior cleaning. Tray serves can also be equipped with wire shelving for even greater flexibility. Depending on your holding needs, tray servers are available with two different heating systems: Humi-Temp or Top-Mount. During the heating and holding process, products lose moisture causing shrinkage while also effecting the food's quality and overall appearance. Introducing a humidified heating system into a foodservice operation for moisture sensitive foods can help solve those problems. The TS series utilizes FWE's humidifying heat system, Humi-Temp, which pre-conditions the cabinet environment by gently circulating moist air throughout the interior, eliminating hot and cold spots. The bottom mounted heating element and blower system create heated air that collects moisture as it passes over the water pan to create a humid cabinet environment. The heating system minimizes temperature difference top-to-bottom and side-to-side, which allows for the entire cabinet to be used, even the lowest shelf. Humidity level within the cabinet depends upon the water pan level and the cabinet temperature. Equipped with the Humi-Temp passive-humidity heat system, cabinets come standard with removable water pans which slide in and out for easy water fill and cleaning. The TS-1633 series is FWE's pizza series. 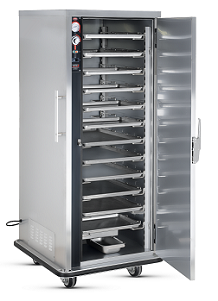 Pizza heated holding cabinets hold pizzas that are fresh and ready to serve, longer than ever before, giving operators tremendous flexibility in food production strategies. To learn more about the pizza series, visit www.fwe.com/learn/An-Introduction-to-Pizza-Cabinets. Not all operations require moisture control. For those that do not require moisture control, FWE's Top Mount heat system is a better fit. TST series features FWE's Top Mount heat system, which enables large air circulation of hot air throughout the interior of the cabinet, eliminating hot and cold spots. These units are ideal for operations looking for an open bottom base, free of obstructions. Heating elements and blower are protected from spillage and leave the bottom of the cabinet open for easy cleaning and reduced maintenance costs. Narrow spaces are not problem with the slim design of the TST series - the built in top mount heat system provides a slim cabinet profile, yet meets demand for high capacity. Canned fuel adapter packages are available in select models. Using canned fuel, cabinets are able to maintain heat unplugged, allowing the ultimate in mobility and versatility for heated holding. Slide out drawers have safety catches on the inside of the unit, assuring canned fuel remains in unit during transport. On all tray server models, heat systems are built into the cabinet to reduce maintenance and cleaning costs. Never worry about losing your removable heat module again. Controls are up-front, easy to read and set, and include a full-range thermostat for easy operation and to give you full control over your product. Our cabinets are built tough using stainless steel inside and out, providing maximum reliability and sanitation. Welded construction and our exclusive tubular stainless steel base frame ensure that our cabinets will withstand the most demanding use. Cabinets are fully insulated top, bottom, sides, and door to provide energy efficient heating and longer holding times. FWE tray servers are made for transport applications. One piece tubular welded base frame is designed to absorb vibration and shock during transport. Corners have cut outs to facilitate easy cleaning. High temp gasket sealed door assures a tight seal even during transport. Caster stress plates are mounted on the base of the unit to absorb shock during transport. Full perimeter bumpers extend beyond door and handles for added protection during transport and are available on some models. FWE offers a variety of optional accessories for our Tray Servers, to learn specifics, see literature, additional photos and get a quote, visit www.fwe.com/products/heated-holding.